Free 4.0Ah Battery ($120 value) with DeWalt DCF620M2 20V Max XR Li-Ion Brushless Drywall Screwgun (4.0Ah) Kit $269. Two 4.0Ah batteries are already included in the kit. 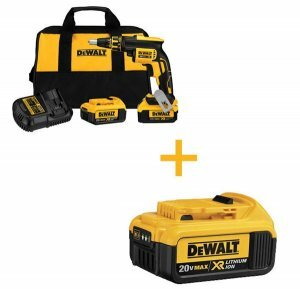 Free 2.0Ah Battery ($90 value) with DeWalt DCF620D2 20V Max XR Li-Ion Brushless Drywall Screwgun (2.0Ah) $199. Two 2.0Ah batteries are already included in the kit.